The incidence of the MDR1 gene for the breeds affected are for example: Rough Collies 70%, Australian Shepherds 50%, Shetland Sheepdogs 15%, German Shepherds 15% and Border Collies < 5%. The list has many more breeds contained within it but mostly they are in the pastoral group. Acepromazine (tranquilizer and pre-anaesthetic agent). In dogs with the MDR1 mutation, acepromazine tends to cause more profound and prolonged sedation. We recommend reducing the dose by 25% in dogs heterozygous for the MDR1 mutation (mutant/normal) and by 30-50% in dogs homozygous for the MDR1 mutation (mutant/mutant). Butorphanol (analgesic and pre-anaesthetic agent). Similar to acepromazine, butorphanol tends to cause more profound and prolonged sedation in dogs with the MDR1 mutation.We recommend reducing the dose by 25% in dogs heterozygous for the MDR1 mutation (mutant/normal) and by 30-50% in dogs homozygous for the MDR1 mutation (mutant/mutant). Emodepside (Profender) is a deworming drug approved for use in cats only in the U.S., but is approved for use in dogs in some other countries. Use of this drug in dogs with the MDR1 mutation has resulted in neurological toxicity. Erythromycin. Erythromycin may cause neurological signs in dogs with the MDR1 mutation. A mutant/mutant collie exhibited signs of neurological toxicity after receiving erythromycin. After withdrawal of the drug, the dogs neurological signs resolved. There were no other potential causes of neurological toxicity identified in the dog. Ivermectin (antiparasitic agent). While the dose of ivermectin used to prevent heartworm infection is SAFE in dogs with the mutation (6 micrograms per kilogram), higher doses, such as those used for treating mange (300-600 micrograms per kilogram) will cause neurological toxicity in dogs that are homozygous for the MDR1 mutation (mutant/mutant) and can cause toxicity in dogs that are heterozygous for the mutation (mutant/normal). Loperamide (ImodiumTM; antidiarrheal agent). At doses used to treat diarrhea, this drug will cause neurological toxicity in dogs with the MDR1 mutation. This drug should be avoided in all dogs with the MDR1 mutation. Selamectin, milbemycin, and moxidectin (antaparasitic agents). Similar to ivermectin, these drugs are safe in dogs with the mutation if used for heartworm prevention at the manufacturer's recommended dose. Higher doses (generally 10-20 times higher than the heartworm prevention dose) have been documented to cause neurological toxicity in dogs with the MDR1 mutation. Vincristine, Vinblastine, Doxorubicin (chemotherapy agents). Based on some published and ongoing research, it appears that dogs with the MDR1 mutation are more sensitive to these drugs with regard to their likelihood of having an adverse drug reaction. Bone marrow suppression (decreased blood cell counts, particulary neutrophils) and GI toxicity (anorexia, vomiting, diarrhea) are more likely to occur at normal doses in dogs with the MDR1 mutation. To reduce the likelihood of severe toxicity in these dogs, MDR1 mutant/normal dogs should have their dose reduced by 25% while MDR1 mutant/mutant dogs should have their dose reduced by a full 50%. These patients should be closely monitored for adverse effects. Cyclosporin (immunosuppressive agent). While we know that cyclosporin is pumped by P-glycoprotein (the protein encoded by the MDR1 gene), we have not documented any increased sensitivity to this drug in dogs with the MDR1 mutation compared to "normal" dogs. Therefore, we do not recommend altering the dose of cyclosporin for dogs with the MDR1 mutation, but we do recommend therapeutic drug monitoring. Digoxin (cardiac drug). While we know that digoxin is pumped by P-glycoprotein (the protein encoded by the MDR1 gene), we have not documented any increased sensitivity to this drug in dogs with the MDR1 mutation compared to "normal" dogs. Therefore, we do not recommend altering the dose of digoxin for dogs with the MDR1 mutation, but do recommend therapeutic drug monitoring. Doxycycline (antibacterial drug). While we know that doxycycline is pumped by P-glycoprotein (the protein encoded by the MDR1 gene), we have not documented any increased sensitivity to this drug in dogs with the MDR1 mutation compared to "normal" dogs. Therefore, we do not recommend altering the dose of doxycycline for dogs with the MDR1 mutation. Morphine, buprenorphine, fentanyl (opioid analgesics or pain medications). We suspect that these drugs are pumped by P-glycoprotein (the protein encoded by the MDR1 gene) in dogs because they have been reported to be pumped by P-glycoprotein in people, but we are not aware of any reports of toxicity caused by these drugs in dogs with the MDR1 mutation. We do not have specific dose recommendations for these drugs for dogs with the MDR1 mutation. The following drugs have been reported to be pumped by P-glycoprotein (the protein encoded by the MDR1) in humans, but there is currently no data stating whether they are or are not pumped by canine P-glycoprotein. Therefore we suggest using caution when administering these drugs to dogs with the MDR1 mutation. There are many other drugs that have been shown to be pumped by human P-glycoprotein (the protein encoded by the MDR1 gene), but data is not yet available with regard to their effect in dogs with the MDR1 mutation. 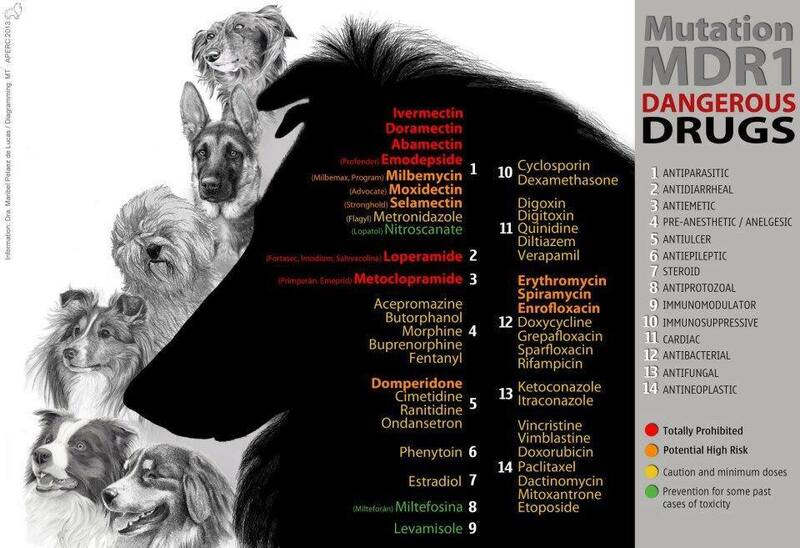 Many herding breed dogs (the most commonly affected in the UK are: All breeds of Collie, Shetland Sheepdog, GSD and, Australian Shepherd dogs - including cross breeds) have a genetic predisposition to adverse drug reactions involving over a dozen different drugs. The most serious adverse drug reactions involve several antiparasitic agents, Ivermectin, Milbemycin (and related drugs), the antidiarrheal agent Loperamide (Imodium), and several anticancer drugs (Vincristine, and Doxorubicin, plus several others). These drug sensitivities result from a mutation in the multidrug resistance gene (MDR1 gene). A test distinguishes between clear, carrier and affected dogs. Clear dogs have no copies of the mutant gene responsible for the condition and will neither develop the condition nor pass the gene on to their offspring. Carrier dogs have one copy of the normal gene and one copy of the mutant gene, they will not develop the condition, but will pass a mutant gene on to approximately half of their offspring. Affected dogs have two copies of the mutant gene that causes the condition, and therefore, will react adversely to certain drugs. Selamectin (Stronghold®), Milbemax® and Advocate® .